With each release that followed the Gamecube title, the Animal Crossing titles felt, to me, at least, more of expansions on a preexisting core game than full-fledged ‘new’ games. Animal Crossing: New Leaf follows this design of being more evolutionary than revolutionary, but makes a number of noteworthy strides that places it in territory well ahead of its predecessors. One of the most distinct changes is made apparent within the first ten minutes of gameplay – that, of course, being the degree of control players have over the design of their town. While the horizontal main street to the north will always play host to the museum, convenience store, clothing shop, post office, and other frequently-visited buildings, players can select from a handful of predetermined map layouts that will alter the position of the local river, the natural ramps that lead down to the beach, and the mayor’s office. Once the geography of the town is determined, players can select just about any plot of land to claim for their own house, provided it fits the dimensions required for eventual expansions. From there, players assume the role of the town’s mayor, a responsibility which local secretary Isabelle assures the player is no mistake. As mayor, players have the ability to select construction projects recommended by their animal neighbors, ranging from new bridges, to a lighthouse, to a campground for temporary visitors, and even expansions and renovations to previously existing places on the main street hub north of town. It is true that each previous Animal Crossing game placed heavy emphasis on understanding your town’s economy, and the worth of individual items in terms of both sales and application to your home or neighborly friends. However, everything in New Leaf costs money, from the more obvious clothing and furniture purchases, to expanding your home, to completing construction projects, to disposing of the odd boot or tin can that is reeled in from the river. It makes the early game more of a crawl than a walk, but a few days later and the game grants you all the freedoms of the previous games and then some. New Leaf adopts the same cartoonish proportions and bright colors of its predecessors, and the soundtrack is simply stated, but it certainly isn’t a game that is lacking in charm. Whereas in previous Animal Crossing titles, the island was home to one unique inhabitant, New Leaf alters it purpose, offering tours as well as exotic fruits, insects, and sea creatures that can earn you more impressive financial returns than most of what can be caught within the villages. While the familiar fishing rod, shovel, axe, and bug net are present, so are watering cans to keep flowers healthy, slingshots to shoot down uncommon balloon-carried gifts, a stopwatch, and a megaphone. As a reward for catching a high number of fish and insects, the game even offers fishing rods and bug nets of particular colors that indicate the current completion status of your checklist. As is only to expected, this latest entry offers a decent number of new neighbors and furniture sets on top of the preexisting pool of options. There are, however more outlets through which you can acquire different home decorations. You can also influence which neighbors stay in your town versus which ones move out with relative ease. Above all else, this Animal Crossing title makes the fruits of your labor more visibly obvious, with your town gradually transforming from a basic series of houses set in a forested area to a more fully-functional community with outdoor decorations and major landmarks. Whether a result of hardware limitations or a general lack of inspired direction, the online components of both the DS’ Wild World and the Wii’s City Folk seemed half-baked. New Leaf, however, pushes the communal multiplayer aspect in directions that feel natural and fluid with the single player experience. 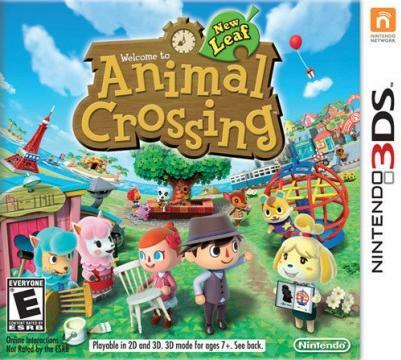 In short, Animal Crossing: New Leaf makes a few tweaks here and there to offer more user-friendliness, adds enough new elements to stand out over its predecessors, and offers a full package that feels the part of a proper sequel to the Gamecube title that first introduced North American gamers to the series. My review of Guardians of the Galaxy, Volume Four: Original Sin. Written by Brian Michael Bendis, Illustrated by Ed McGuinness and Valerio Schiti. My review of Captain Marvel, Volume Two: Stay Fly. Written by Kelly Sue DeConnick, illustrated by Marcio Takara and David Lopez.